This item is not available for purchase online. Please call (907) 455-0299 for more information. 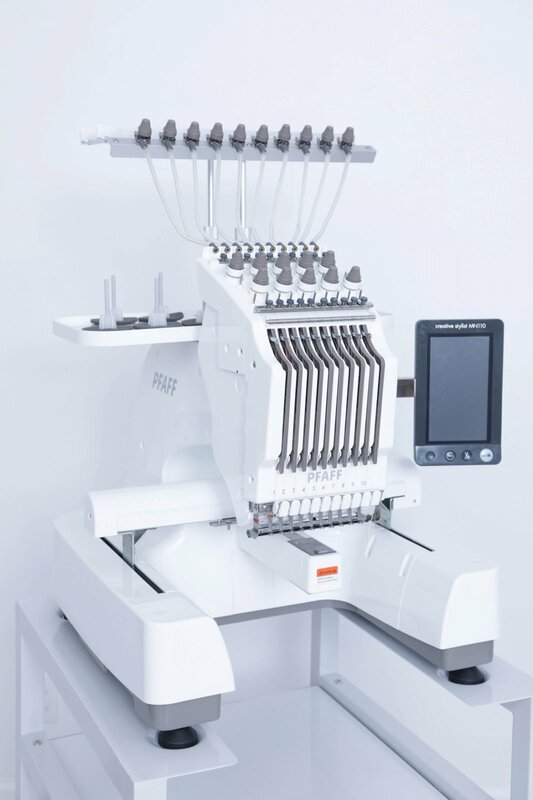 Embroidering large projects or a large quantity of projects is easier and faster with the intuitive creative stylist™MN 110 multi-needle machine. The creative stylist™ MN 110 automatically moves to a different needle with every color change indicated in the design. The 7" (178mm) HD LCD true color touch-screen features a naturally intuitive interface. A multi-angle, rotatable, and adjustable control panel bracket allows for better visibility. Embroider designs up to 310mm x 210mm (12"x8") in one hoop. Embroider complex designs in a fraction of the time with up to 10 colors threaded at once. The 220-degree wide-angle cap system allows users to embroidery around any cap with ease. Plus, your creative stylist™ MN 110 will automatically flip your design 180 degrees whenever the cap driver is attached, so you don't have to. Embroidery the perfect cap with the included accessories: 2 cap hoops, the cap hoop driver, and the cap hoop station.